Icons of the wild — lions, tigers and other big cats — are fading from the world’s wild places, warn conservation experts worldwide. 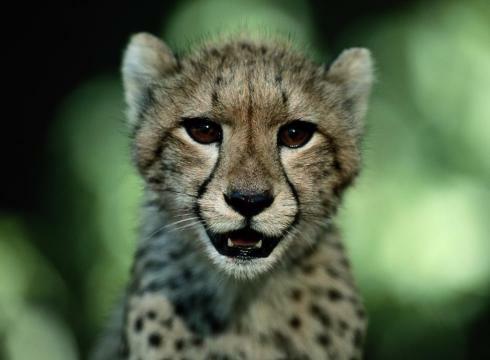 The world’s population of big cats, like this juvenile African cheetah, has been decimated, say conservation scientists. They could face extinction within two decades. Their plight was overshadowed by last week’s release and subsequent killing of captive big cats, including Bengal tigers and African lions, from a private preserve in Zanesville, Ohio. Kin living in the wild have dramatically worsened: Wild lions, tigers and other big cats may face a slide toward extinction within two decades, say conservation scientists, who are urging increased efforts to save them. The populations of lions, leopards, cheetahs and especially tigers have been decimated in the past half-century. Tigers have become so rare that lions have become their soup-bone substitutes, sought for Asian medicines and “tiger bone” wine, Dollar and other conservation scientists say. Find out more about the Big Cats Initiative at Www.causeanuproar.org. -Trick-or-treating kids are collecting donations Monday. Look for the lion, tiger or big cat costumes. -Text-message “BIGCATS”to 50555 to make a $5 or $10 donation. -Donate $5 and the initiative will add a photo of your own house cat to National Geographic’s website as a show of support. The initiative has costume-making instructions for Halloween. For more information, National Geographic magazine’s next issue will be devoted to the plight of the big cats. And on cable, the Nat Geo WILDchannel will host its 2nd annual “Big Cats Week”in December. For 25 years, Joubert and his wife, Beverly, made PBS documentaries such as Eternal Enemies: Lions and Hyenas from their home in Botswana. “We had this wonderful life, but there was always the sinking feeling that the big cats were disappearing,”Beverly Joubert says. So the documentary makers “took National Geographic by the lapels,”scientist Luke Dollar says, and persuaded the society, which has sponsored much of the Jouberts’ work, to put some muscle behind conservation of lions and cheetahs. Over the course of 18 months, the initiative awarded 19 grants to conservation efforts across Africa. Efforts range from teaching herders better ways to protect livestock, to starting Africa’s first livestock insurance program against lion losses. To raise funds, the campaign is urging schoolchildren to dress as lions for Halloween and collect donations. Without top predators, booming prey populations soon strip vegetation and later collapse from illnesses and starvation. At Yellowstone National Park, elk devoured stream-protecting cottonwoods without wolves. Dolphins and sea cows wiped out sea grasses in Australia’s Shark Bay without tiger sharks to chase them into deeper waters. Sea urchins ate kelp forests off Alaska’s coast after sea otters numbers dropped in the late 1990s. • Lions are down to perhaps 25,000 in the African wild, where 450,000 formerly roamed. • Leopards are down to 50,000, from 750,000. • Cheetahs number about 12,000, down from 45,000. • Tigers number about 3,000 in the wild, down from 50,000 total. Perhaps only 1,200 breeding wild females exist. In the long term, conservation experts would like to see “corridors” opened between African nature reserves to allow lions and other big cats to mingle, preserving their genetic diversity as a hedge against illness and congenital diseases. A similar “jaguar freeway” has been proposed for Central America. “The good news about big cats is that they are resilient and will breed to recovery, if allowed,” Robinson says. Snow leopards found in remote Central Asia, look to retain healthy population sizes for this reason, he says. bigcatrescue.org How much did you like this?